As we all know, many clubs will move grounds at least once in their history. Some twice. In Clyde's case, about 1,297 times. Montrose are not one of those clubs, having played at Links Park from the day they were founded in 1887. 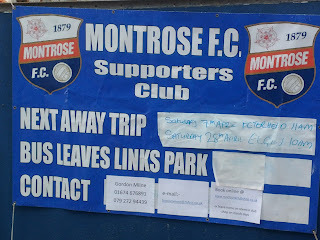 Interestingly, I realised ahead of this match that I had not only never seen Montrose FC play football but I'd also even been to the town. I therefore decided to enlist the help of a long-time friend, resident of Dundee and visitor to Angus grounds. 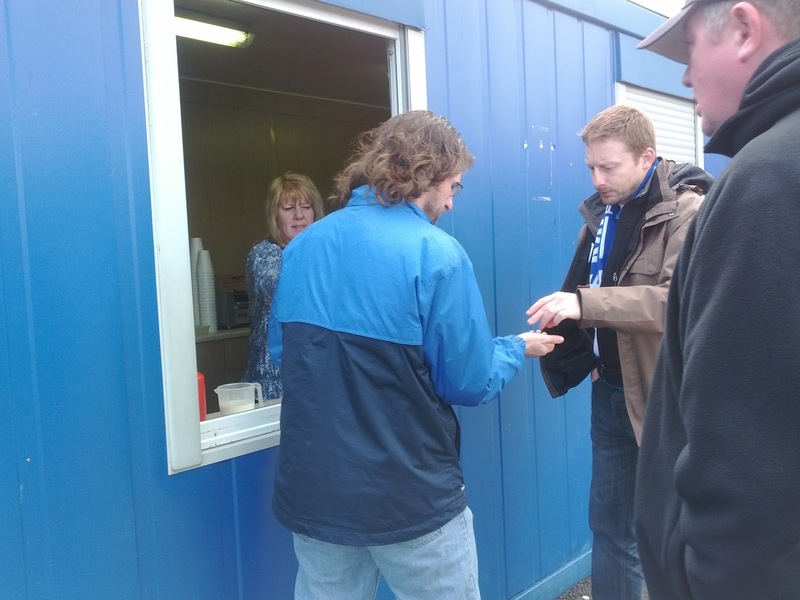 On entering the very old turnstiles at Links Park I was immediately met by the friendliest matchday steward I have ever met. An older guy, who had just moved down from Keith, was curious as to where Mike & I had come from, why we were there, who we supported etc. After agreeing that the best way is to be a fan of "all fitba", the next stop was to check out the club shop. Anne: guardian of the merchandise! The fun doesn't end there though. Oh no. On turning to make our way into the stadium proper, you were faced by the famous (or maybe after this) Montrose Wall Of Information. Wondering who the next away opponents are? Who is organising the bus? How to contact them? Never fear...the answers to all your questions have been consolidated into one easily digested chart. 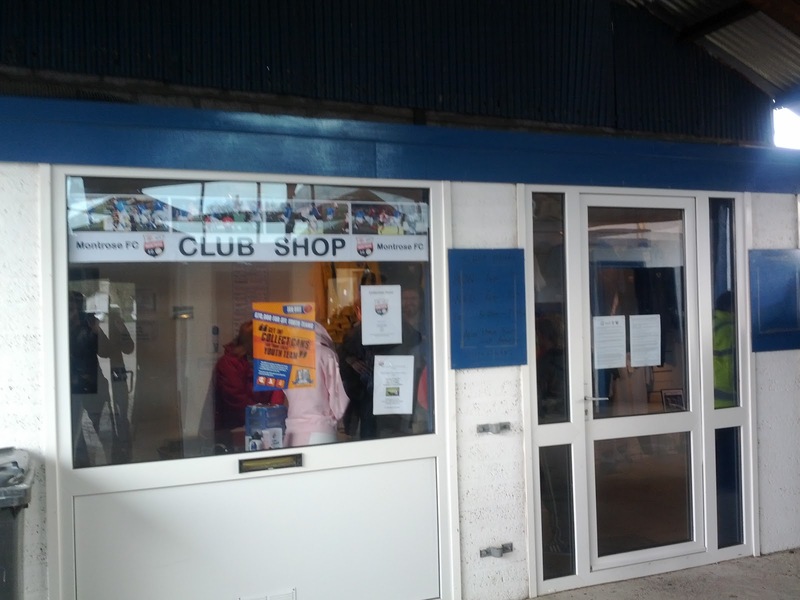 Making my way into the ground, at last, I was immediately struck by the openness of it all. 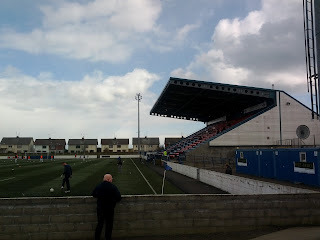 With the exception of the sizable Main Stand which holds circa 1200 people, Links Park takes the form of open terraces at two ends and a covered terrace behind the entry-side goal. This means, of course, that you can walk round the entire stadium at any given time (check!) and that you can do a half time swapsies in line with which way your team is shooting (check, check!). In OTWRB terms this did mean I was able to take the game in from both the Beach End and the Wellington Road. Both with excellent views of the pitch too! 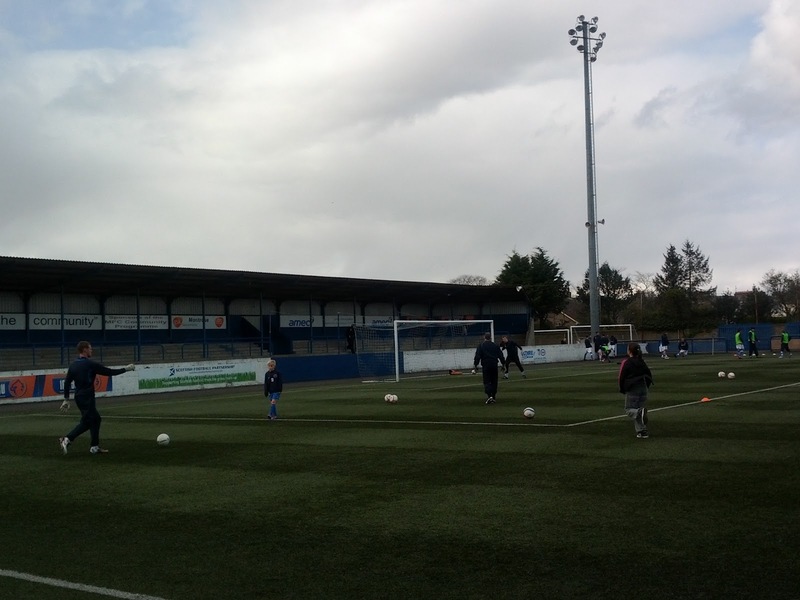 Comfort wise, Links Park seems to be a bit of a wind trap. 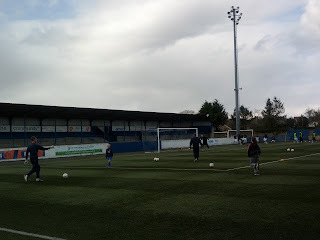 Regardless of where I stood within the ground, it was bloody freezing and extremely windy. Put plain and simply....wrap up! A decently quirky stadium though and quite comfortable so it scores well. Also amusing was the fact that only one of the four speakers on the PR system worked. I've never heard Rivers of Babylon, 9 to 5 and Footloose blasted out in quite the same way! Sourcing the catering was my first problem. Both Mike and I were thoroughly confused by the lack of obvious pie stall. 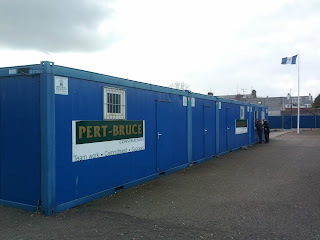 Naturally, I started to explore, walking past these construction branded huts with their shutters closed. All of a sudden....BOOM! One of the shutters flies open and I'm met with a "What you needing, son?" - almost like a ninja in waiting! Anyway, £2.50 later and I was scoffing a pretty nice pie and a rather more ropey tea that tasted a bit like caramel. No complaints overall though. Decent scran at Montrose. First half, the boys we watched the game with were good humoured, very sporting in praising the quality of their opponents and very knowledgeable of the league more broadly. In the second half, a change in ends saw a change of company but no real drop in enjoyment as a very drunk set of old men entertained me with talk of the Grand National, which of the players they felt were twats, and the reason why they respected the French. Namely, "cos they eat horses, instead of racing them!" Sacre Bleu! 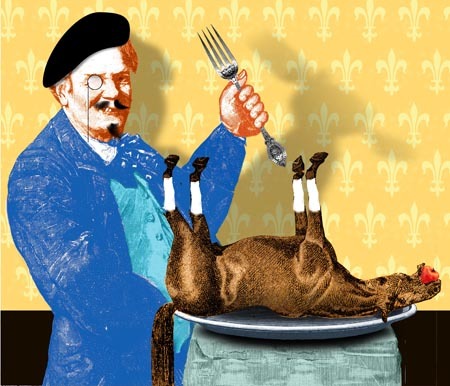 Zis is good Cheval! The performance of the team on the park meant a decent level of noise for a small crowd and, all round, I'd have to say was pretty enjoyable indeed. The score is therefore justifiably high. Looking at the form book before this match, you could be forgiven for expecting Queens Park to rock up in Montrose and win this game without too much discomfort. However, it really didn't turn out that way at all with the home team taking it to their visitors from kick off with some fluid, attractive football. In particular the excellent movement of the forwards & wide men caused Queens all sorts of problems and some of the battling midfield play was equally impressive. 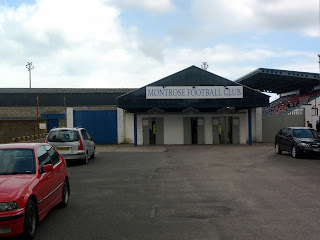 One criticism would be that, at times, Montrose did sit off Queens Park far too much, allowing their very capable visitors to dictate play and create chances. The opening goal for instance, was as a result of Quinn being given far too much space on the edge of the box, ensuring his having plenty time to compose himself and finish well. 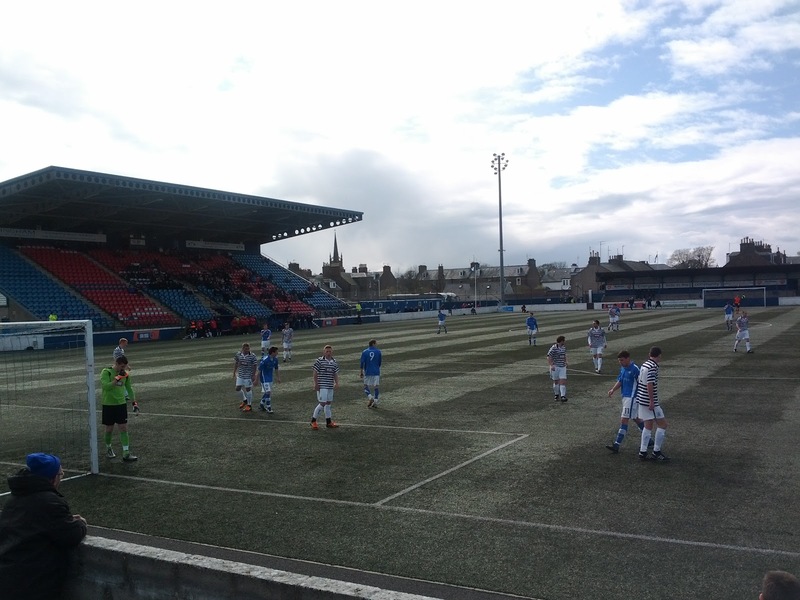 The home team didn't shy away at all though, responding very well with a Crighton header just before half time, an excellent headed finish from Boyle just after the break and a wonderful run and finish from Winter to finish things off. Martin Boyle: The boy was electric. Fantastic turn of pace, close control and running of the channels, he was a constant threat to the Queens Park defence. In reality, he probably should've stuck away a hat-rick but instead had to settle for just one very well taken header to put his team 2-1 up. Talented player with an excellent goal scoring record this season. Scott Johnstone: Boyle's strike partner on the day, he was an excellent foil for Montrose's number 9. With equally good control and awareness, the lad played exceptionally well. He linked up nicely with midfield runners, brought wide men into the match and back-tracked, helping out as and when necessary. Good player. Jamie Winter: He's getting a mention because of his finish for Montrose's third goal. Picking the ball up midway inside the opposition half he beat a couple of men, megged his last defender and then slipped it under the keeper with aplomb. Otherwise, he was solid, efficient and made very good use of the ball when in possession. Overall, a really entertaining performance from Montrose. They played slick passing football at times, the were strong in midfield and looked dangerous. Slack at the back and loose in possession for the last 15 mins, it was a wee bit heart in the mouth stuff but I can't score them anything other than very highly for their show on the day. 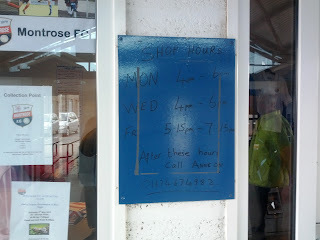 On this evidence, Montrose was excellent value for money. For my £12 entry I was party to a friendly steward, good natured fans, nice food, a stadium in which you can do a half time swap of ends and some cracking football. Well done Montrose. You've taken the title of best experience in Angus! Just short of top spot overall, but definitely somewhere I'd recommend people watch some footie.